Stain Remover Reinforcement Additive is to make car wash easier and more enjoyable. The product is for the below 4 products in order to dramatically advance their cleaning performances: Scale Clean Wheel and Tire Clean Engine Clean Room Clean Each product already has the outstanding cleaning performances, however, with Stain Remover Reinforcement Additive, stubborn dirt or stains that are not easily removable can be removed effectively. While car washing, if you have experienced like: “That stain remains whatever I do” “Give up” then, you must use this product. Each product already has the outstanding cleaning performances, however, with Stain Remover Reinforcement Additive, stubborn dirt or stains that are not easily removable can be removed effectively. then, you must use this product. This is an emblem on a car rear. There are often dirt stack around the emblem and the dirt adheres to it. In this case, you can power up Scale Clean from “scale cleaner for entire car body” to “spot powerful cleaner”. Bamboo Brush is usually used for removing this kind of stain quickly, but with the additive, just using a cotton swab is more than enough. There are no so many people who take off wheels for cleaning the backside of the wheels. We conducted a test that took off the BMW wheels that had significant brake dust. Basically, Wheel and Tire Clean can clean up this perfectly whereas it takes time to clean up such the sever dirt. By mixing with the additive, the dirt can be removed in a short time. An engine room can be quite dirty unexpectedly. There can be dirt accumulated on painted areas in an engine room and once this kind of dirt sticks on the paint, it is quite difficult to remove. Engine Clean basically can clean them up completely, however, for stubborn stains and dirt, you may need to spend you efforts and hours. The combination of Engine Wax and the additive will make your work simpler and quicker. This is a front passenger fabric seat. Some dirt might be less noticeable, it depends on fabric types. Even so, car seats are actually very dirty. If you use Room Clean, you could need to spend times for removing all dirt completely. The additive will help you saving times and effort. In the case that dirt is stuck to a surface completely for a long time, the dirt might not be removable. Please kindly understand this. When mixing the additive with Wheel and Tire Clean, it can be used only with clear coated wheels. It cannot be used with plated wheels or other special processed wheels. It is the strong and powerful additive. Please read the attached instruction manual carefully before using this. There are many kinds of materials used in one car, metals, steels, aluminum, fabrics, plastics and many. It is significantly difficult to develop a cleaner that can be used for various materials and it is actually does not make sense to make such a product because those kind of products do not understand very specific and different characteristics of each material. 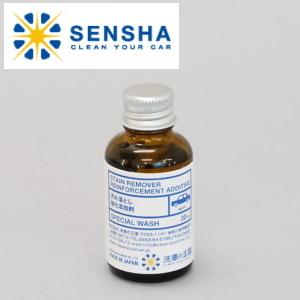 Therefore, SENSHA produces the additive to be mixed with the our existing great part and problem specific products to advance their cleaning powers, hence stubborn and special dirt and stains will be cleaned up easily.